It stopped working when I changed my password to something containing a double quote “. The solution? Change to use WinSCP. The first issue of the Norfolk Developers magazine (outside of a conference) is out now and free to download! 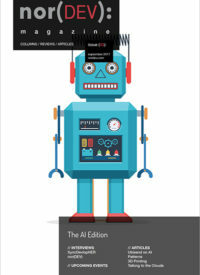 This issue focuses on A.I., a topic we thought a good one to kick off with as everyone has an opinion about Artificial Intelligence, it affects our daily lives (see Dom Davis’ column about arguments with Alexa) and it gave us an excuse to use the awesome robot image on the front cover too. Added PC-lint Plus specific compiler indirect files co-rb-vs2008.lnt and co-rb-vs2010.lnt. co-rb-vs2013.lnt and co-rb-vs2015.lnt now undefine the preprocessor symbols _CPPRTTI, _CPPUNWIND and _NATIVE_WCHAR_T_DEFINED which are hardcoded in the Gimpel supplied compiler indirect files. These definitions should not be hardcoded as Visual Lint will automatically define these symbols where required by the project configuration. Added additional suppression directives to the PC-lint Plus indirect file rb-win32-pclint10.lnt. Fixed a bug in the expansion of project variables within the "Command Line" page in the Analysis Configuration Dialog. If a category with no issues (e.g. "Internal Errors" in PC-lint Plus) is selected in the Message Lookup Display the "Title" and "Description" fields will now be correctly cleared. When multiple views of a file is opened for editing in VisualLintGui, the contents of the views are now correctly synchronised. VisualLintGui now captions the MDI child window tabs correctly when there are multiple instances of the same file open. Fixed a bug in VisualLintGui which prevented MDI windows from being correctly configured if more than one view of a particular file was open. Added a "Window | Close" command to VisualLintGui. The Ctrl+W accelerator and MDI tab "Close" command are now mapped to this command rather than "File | Close". Fixed a bug in the VisualLintGui "Window | Close All" and "Window | Close All Except" commands which manifested when more than one view of a particular file was open. The VisualLintGui "Window | New" command is now disabled if the active MDI child window is a web browser window. Updated the PC-lint Plus message database to reflect changes in PC-lint Plus RC2. I have been working on a prototype level editor for Rabbit Escape, and I’ve had trouble getting the layout I wanted: a toolbar at the side or top of the screen, and the rest a zoomable workspace. Something like this is very common in many desktop applications, but not that easy to achieve in a web page, especially because we want to take care that it adapts to different screen sizes and orientations, and, for example, allows zooming the toolbar buttons in case we find ourselves on a device with different resolution from what we were expecting. In the end I’ve gone with a grid-layout solution and accepted the fact that sometimes on mobile devices when I zoom in my toolbar will disappear off the top/side. When I scroll back to it, it stays around, so using this setup is quite natural. On the desktop, it works how you’d expect, with the toolbar staying on screen at all zoom levels. Read the full source code. Our testing of PC-lint Plus is nearing completion and we expect a formal release of the product during the 4th quarter of 2017. Unlike PC-lint and FlexeLint, licensing of PC-lint Plus will be based on a Team License. To get a quote, please send an email to sales@gimpel.com with your company information, and a brief description of the Team, including the name of your Team and the number of developers (including consultants) that will be working on the source code that PC-lint Plus will be analyzing. While we are waiting for full details we are continuing our testing of the release candidates and (in particular) refining the PC-lint Plus compiler configuration and suppression files installed with Visual Lint. As with PC-lint 9.0, in due course we aim to include a full set of indirect files in the Visual Lint installer - including compiler indirect files for all versions of Visual Studio back to Visual C++ 6.0 - regardless of whether Gimpel provide them (so far PC-lint Plus only includes compiler indirect files for Microsoft Visual Studio 2012, 2013 and 2015). We have already authored compiler indirect files for Visual Studio 2008 and 2010, and others will follow. If you already have a PC-lint Plus RC installation, Visual Lint 6.0 can already analyse projects using both the 32 bit (pclp32.exe) and 64 bit (pclp64.exe) versions of PC-lint Plus and already includes a number of other features (for example multicore per-project analysis) to specifically support PC-lint Plus installations. If you have any specific queries about PC-lint Plus support, just let us know. I am pleased to announce that Just::Thread Pro v2.5.0 has been released. This adds support for gcc 7, clang 4.0 and clang 5.0, but the big change with this version is the support for coroutines with Microsoft Visual Studio 2017, and clang 5.0 on ubuntu when used with libc++ 5.0. V2.5.0 adds support for coroutines with Microsoft Visual Studio 2017 and clang 5.0. This means that you can now use co_await to wait for a std::experimental::future, and can create coroutines that return a std::experimental::future.